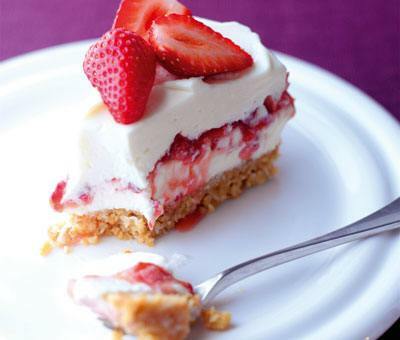 Rich, creamy and sweet cheesecake filling encasing juicy strawberries and sitting on a crumbly biscuit base with coconut. 1. Mix together the crushed biscuits, desiccated coconut and melted buttery spread then lightly press into the tin. Chill for 10 minutes. 2. Whisk together the condensed milk and Mascarpone cheese until completely smooth. Add the lemon juice and combine thoroughly (watch it thicken!). 3. Chop half the strawberries and mix with the jam. 4. Spread half the cream mixture onto the biscuit base. Spoon over all the chopped strawberries and top with the remaining cream mixture. Chill for 4 hours. 5. Halve the remaining strawberries and arrange on top of the cheesecake. Try using raspberries and raspberry jam instead! This is my favourite cheesecake. Its really delicious. I have made it with pineapple as well which was also a great success. The recipe is easy, looks lovely and tastes yummy. Hi, I want to make this with Lighter Marscapone. Will it still thicken & set the same as full fat marscapone? Also might use blueberries as they are nice with coconut. Hi Angie, lighter mascarpone will do the trick! Blueberries are lovely with coconut and add a nice twist. Hi, could you make this cake but miss out the middle filling and maybe just decorate with strawberries on top? Hi Sus, yes this is a very adaptable recipe and it works just as well without the filling although you may lose the some of the delicious strawberriness! You're welcome Lyndsey! Glad you loved it! Hi, i wanted to make this for a picnic, will it be better and still nice to eat if it chills overnight to set? Hi Tasnima, yes it does set better after chilling overnight - but it can make the strawberries very juicy so you could always take the strawberries coated in jam with you and serve at the last minute if you prefer! Have a lovely picnic - hope the sun shines!! Gutted...made this this morning at 9 am.....popped it in fridge to set... just went to fridge to get a bit and it hasnt set?? and its now 4 pm so had 7 hours to set. Its slightly thicker than what it was when I mixed it but no where near being able to come out of its tin...Please help..where did I go wrong?? Never added any lemon juice coz dont like lemons, would this have anything to do with it?? Hi Louise, oh dear! Yes the lemon juice is what sets the filling - so unfortunately it will never set without the juice. You don't actually taste the lemon juice in the final recipe though so don't be affraid to add it. I have made this many times, hubby's favourite. Creamy and decadent - not good for the diet! Very easy to make but collapsed once out of the tin. Took it to my friend for her birthday and very disappointed.Advice please! Hi Helen, sorry to hear that - sometimes strawberries have so much juice in them it makes the middle layer quite wet - try putting in half the mixture and serving the rest on the top instead. This was very easy to make. It tasted refreshing and sweet. Will be making this regularly now! Summer Strawberry, Mascarpone and Coconut Cheesecake is rated 5.0 out of 5 by 1.